Training Delivery and Evaluation is essential for anyone who wants to gain knowledge and insight into professional training delivery skills and evaluation techniques. This course is often referred to as the "New Train The Trainer" as it is very similar in content to the old Train The Trainer course. During this 5-day workshop, you will gain valuable, practical experience delivering mock training sessions. You'll also receive helpful feedback from our experienced trainers. 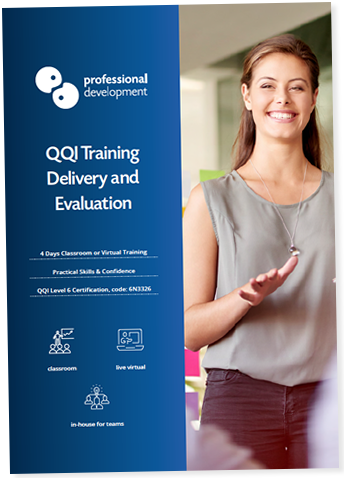 What are the benefits of this QQI Level 6 Training Delivery and Evaluation Course? Work on your training delivery skills and develop your confidence as a trainer. Add credibility to the skills you get during this course with a respected QQI Level 6 Certification. Become familiar with tested and proven methods of delivering and evaluating training programmes. Attending our Training Delivery and Evaluation course will equip you with a structured method for implementing the Delivery and Evaluation stages of the Training Cycle. Understand the importance of training evaluation and become familiar with a range of evaluation models. We have listed an outline of the course content below. If you would like more detail, you can instantly download our full course brochure now. Is The Train The Trainer Course Still Available? The old FETAC Train The Trainer Level 6 award was de-activated by QQI and is no longer available. 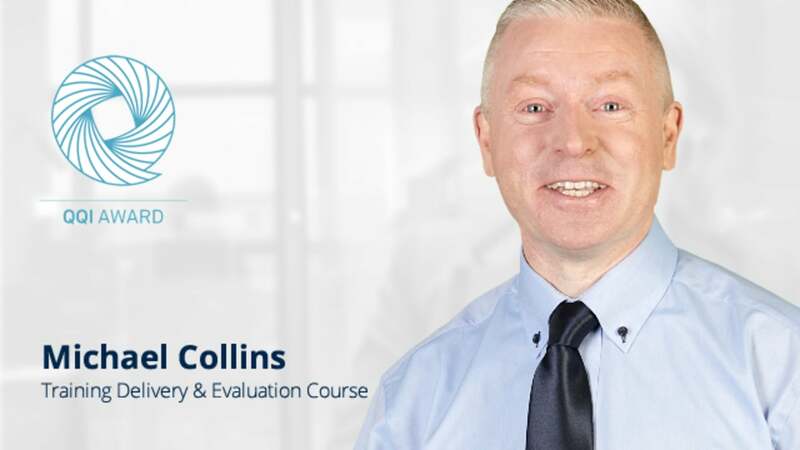 The new QQI Training Delivery and Evaluation Level 6 course is the closest replacement in style and content to the old Train The Trainer course. Is my Train The Trainer Award still valid? If you have already achieved the old FETAC Train The Trainer award (code: E30179), your certification is still valid and will continue to be recognised by QQI under the National Framework of Qualifications (NFQ). In fact, your existing award may entitle you to an exemption towards the new QQI Special Purpose Award in Training and Development. This exemption is only available for a limited timeframe, so if you are interested in claiming an exemption, you need to act quickly. You can download our full Training Delivery and Evaluation brochure by clicking below. You can also click to Ask a Quick Question, or speak with us by phoning Freephone 1800 910 810. Do I need experience to attend? No previous experience is needed to attend this course. Training Delivery and Evaluation works both as a foundation course for new trainers and a refresher for experienced trainers. This course is placed at Level 6 on the National Framework of Qualifications (NFQ), and its QQI course code is 6N3326. When you complete this course and its assessment work successfully, you will gain a minor award certificate in Training Delivery and Evaluation, worth 15 credits towards a Special Purpose Award in Training and Development (code: 6S3372). What is the Training and Development Special Purpose Award? By completing and passing both of these components and their assessments, you gain the Special Purpose Award. Do I need complete both components? No. You only need to complete both components if you would like to achieve the Special Purpose Award in Training and Development. Both components can be taken as stand-alone courses. Will achieving the QQI Training and Development Special Purpose Award help my career? Yes, completing this Special Purpose Award will demonstrate to potential employers that you have achieved competency and skill in all 4 stages of the Training Cycle. We'll be happy to answer any other questions you may have by phone or email. You can click the button below to ask a question online, or call us on Freephone 1800 910 810.